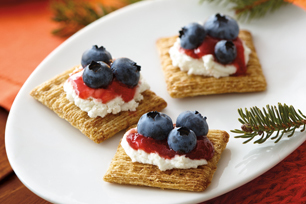 Makes 16 servings, 3 topped crackers (35 g) each. Use pulsing action of food processor to process mushrooms until finely chopped; place in medium skillet sprayed with cooking spray. Add peppers, thyme and garlic powder; mix well. Cook on medium-high heat 8 to 10 min. or until mushrooms release all their liquid, stirring frequently. Remove from heat. Stir in parsley. 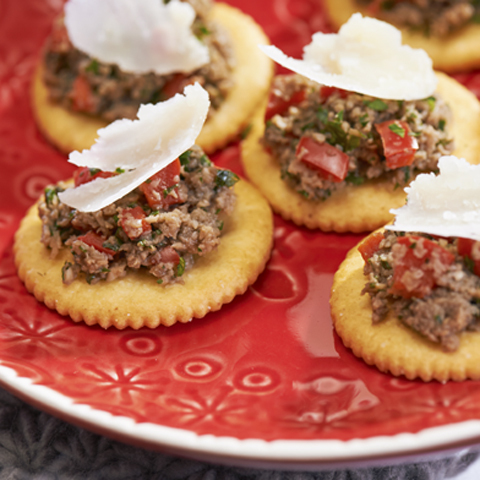 Spread mushroom mixture onto crackers; top with cheese.